What’s new in Wi-Fi Technology? Operators providing broadband access are expected to provide a consistent experience for users that are consuming data throughput in a large variety of environments. The consumer’s expectations are that their video sessions or games will work well no matter where they move within their house - that sessions won’t drop and that devices running high capacity applications won’t starve the other devices. These technologies improve the Wi-Fi experience by dynamically optimizing Wi-Fi characteristics to the changing device and application needs. However, optimization is limited by the hardware structure – meaning, the optimization is confined within each of the two Wi-Fi bands and the physical characteristics of each (MIMO configuration, Amount of antennas). 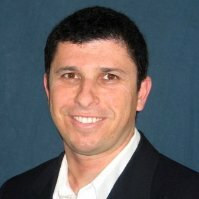 The remarkable new opportunity that Elastic MIMO technology brings to Wi-Fi Access Points (AP) is to dynamically adapt the MIMO system between 2.4GHz and 5GHz bands and optimize in real time according to the unique needs of the specific environment at any given time. There is a huge competitive advantage that elastic MIMO technology can give operators offering wireless mesh node and extender systems. Mesh Wi-Fi systems and Wi-Fi extenders consist of a main Wi-Fi Access Point or Gateway, and one or more “satellite” APs, placed around the house or office for full Wi-Fi coverage. They are all part of a single wireless network and share the same SSID and password. 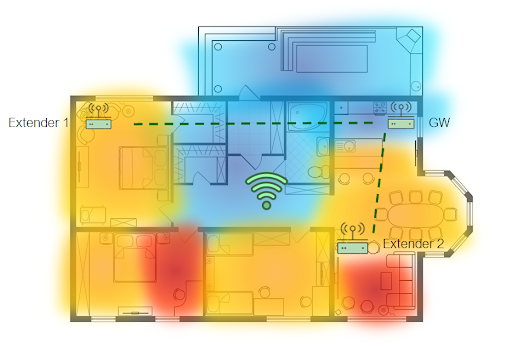 The specific placement of APs is done by the consumer, and the specific point where the device is placed is unpredictable for the operator and often not ideal for optimized Wi-Fi performance and coverage. The consumer’s considerations are often aesthetic, and also depend on where they have an available power socket and some room on a shelf. See an example of a home where 3 APs are forming a mesh Wi-Fi system. In a previous article, “Not All Homes are Created Equal - Elastic MIMO Overcomes This”, we explained how Elastic MIMO technology, with one type of AP, can help service providers overcome the challenge of varied home sizes and environments. Similarly, in the scenario of a mesh system, each node is placed at a different distance from the gateway and is servicing a different level of demand for throughput (The red color in the image above indicates areas with high demand, yellow is medium demand, and the blue areas with low demand). The elastic MIMO hardware architecture with the aid of self-learning algorithm optimizes the allocation of radio chains and MIMO streams between the 2.4GHz and 5GHz radio bands according to the actual measured need at any particular moment. When implementing a wireless mesh system, even with a single extender, let alone with multiple mesh nodes, the challenge is in balancing resource allocation for serving end devices (“fronthaul”) vs. for “backhaul” (between the satellite APs and the Gateway AP) for optimal performance. Currently, the most common implementation approach is allocating one of the bands to service the end devices, and the other to service backhaul. Sometimes the allocation is right while in others one of the bands is used for both the backhaul and the fronthaul concurrently. The split between how many streams are 5GHz and how many are 2.4GHz is rigid, dictated by the hardware and is set in early design stages. For example: if the AP is equipped with total of 8 antennas 4x4+4x4 MIMO system then the backhaul is limited to 4x4 5GHz capacity and most likely share fronthaul service as well. Elastic MIMO, alternatively provides APs with flexibility (or elasticity) so that the allocation of bands to backhaul can increase or decrease as needed. In the example above, Extender 1 may have been placed far away from the GW while Extender 2 is relatively nearby. With this in mind the ideal hardware specification for Extender 1 best would be with higher antenna count and MIMO streams for the backhaul band to ensure sufficient link budget and capacity to be served in that area of the house (vs. the other band used exclusively to serve the nearby clients). This capability could be “make or break” for Extender 1 while without this post-deployment capability Extender 1 had to be moved to a closer location, perhaps less desirable. Perhaps in this scenario allocating 6x6 to the 5GHz backhaul channel and maintaining only 2x2 for the 2.4GHz would make the best configuration. Extender 2 which is closer to the GW may suffice with 4x4+4x4 configuration to maximize the capacity to serve in that part of the house. Multiple AP deployments and Mesh systems backbone has so much variance built into them for the mere unpredictability associated with their locations in the house and with respect to one another. Enabling hardware with this level of flexibility and run time adaptability enables consistent service where the end users really feel that the Wi-Fi is always on, no matter where they are in their home. ElasticMIMO™ is a disruptive technology designed to deliver the best user experience in Wi-Fi 6 environments by dynamically allocating its 8T8R MIMO system to two Wi-Fi transceivers - 2.4GHz and 5GHz bands based on real-time performance needs, creating an elastic MIMO configuration ranging from 2x2 and up to 6x6 per each Wi-Fi modem. Learn more and watch our deep dive into why Elastic MIMO is the future of intelligent Wi-Fi networks.